Whenever a big LAN tournament is going on people are always asking why the pros are wearing earbuds and a headset on top of that. We answered that question on our blog, and with that we got the idea to review one of those sets of earbuds. 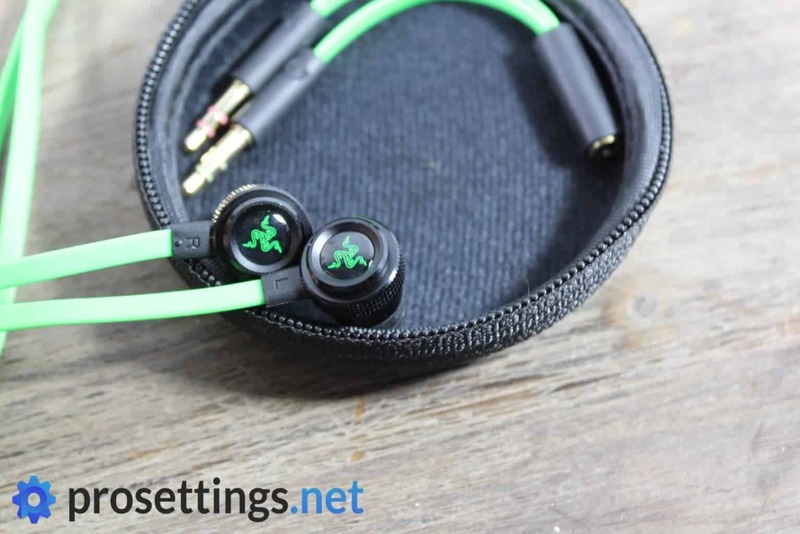 The Razer Hammerhead Pro v2 is one of the more commonly used pair or earphones in the professional scene, so we let our reviewer take a look at them to see how they fare as gaming headphones. 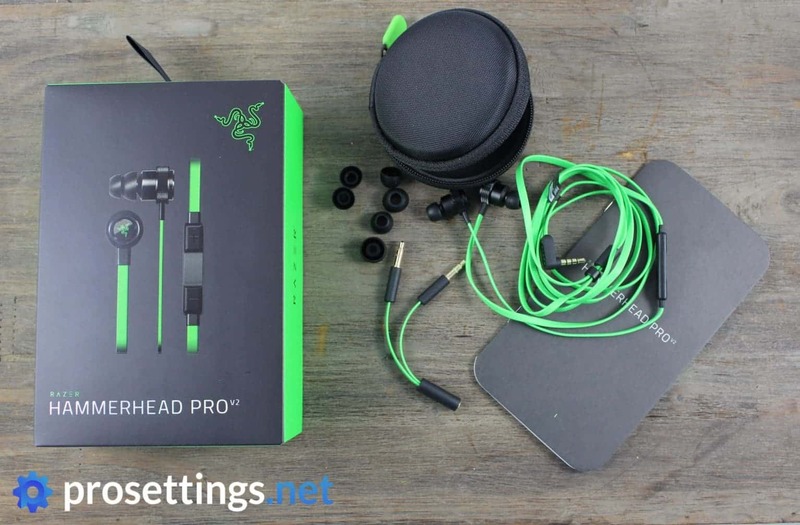 This review is meant to be just a little bit of fun; for 99% of gamers we’d always recommend to get an actual headset or a pair of headphones, but we thought it could be interesting to see how these perform in a real gaming scenario. Read on to find out! The Hammerhead Pro v2 is commonly used on stage by professional players, in combination with a noise-canceling headset. Opening the little box of the Razer Hammerhead Pro v2 (I’ll refer to it as ‘Hammerhead’ from now on) delivers quite a pleasant surprise. Razer has included a bunch of extras with the earbuds, including a jack splitter, three different pairs of earpieces and a small and sturdy carrying pouch. Extra stuff is always appreciated and it’s certainly a nice touch that they’ve included the pouch to hold it all. The rest of the box is filled with the usual documentation and two Razer stickers. The earphones themselves seem to be built very nicely. 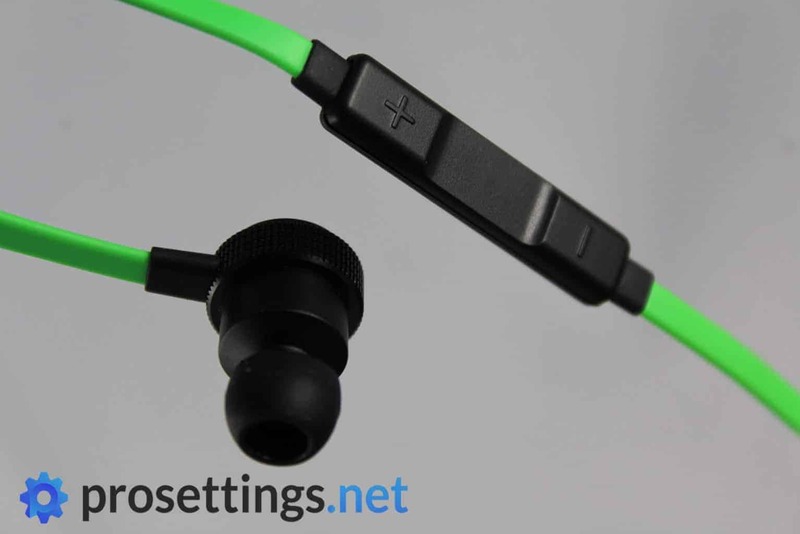 There’s an anti-tangle flat cable and the earpieces are made out of a very sturdy aluminum. Couple that with the fact that you’ve got a very strong and durable carrying pouch and you can imagine that these earphones will last you for years. 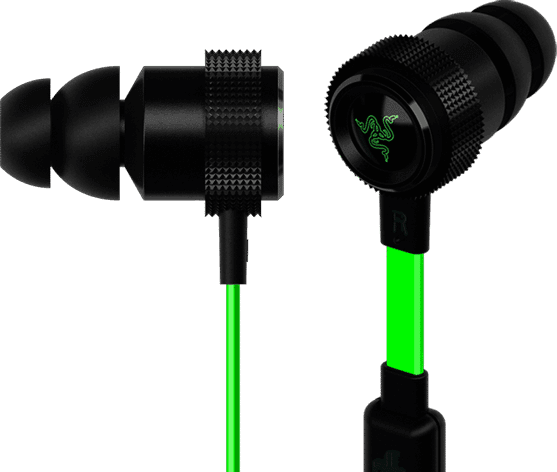 The cable itself is (as you have already noticed, no doubt) finished in the signature Razer green color, and in the center of each earpiece you’ll find the classic Razer logo, but (aside from the color) you won’t notice any outrageously ‘game-ish’ designs. One of the lines that Razer uses to advertise this product is ‘hammering in the bass,’ and they definitely aren’t lying there. For a pair of earphones the Hammerhead Pro v2 delivers a very deep and punchy bass across the board. 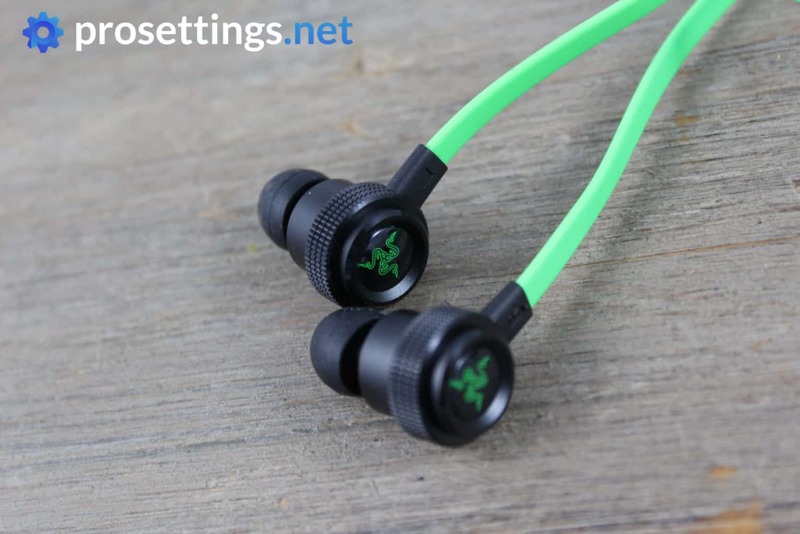 The sound quality as a whole is pretty impressive, though (to me at least) it seems like Razer has opted to go all-in on the lows and highs, leaving the middle frequencies to be drowned out a bit. That’s not something objectively bad, but if you’re buying a piece of audio equipment that doesn’t allow you to tweak the sound settings it’s always good to know the audio characteristics beforehand. When it comes to gaming the Hammerhead performs quite admirably as well. I was pleasantly surprised by how well it handles positional audio in games such as CS:GO, and that coupled with the impressive bass response makes the earphones sound way ‘larger’ than they actually are. Don’t get me wrong; a decent pair of over-ears is almost always going to be better at representing ingame audio by design, but that doesn’t mean that the Hammerhead is a chump. Due to the impressive bass response you can get some really immersive ‘oomph’ moments whenever there’s heavy gunfire or an explosion, and regular conversation and normal sounds are quite clear as well. The mic (there’s a short mic sample to the right) is fairly decent, too. You definitely don’t want to use it when you’re moving around or in any sort of noisy environment but if you’re sitting relatively still and there’s no background noise it’s actually very clear. For tournament/LAN purposes I’d recommend you to get a more reliable separate mic, but for home usage this one’s perfectly fine. The Hammerhead Pro v2 definitely took me by surprise. Would I ever use it for competitive gaming? No, unless I had to use earbuds and a noise-canceling headset combo like the pros, but it’s definitely quite an interesting product. If you’re always gaming on the go or you’re more of a casual gamer looking for an all-purpose solution that’ll fulfill your PC, console, and mobile needs this product certainly deserves a look. Competitive gamers or people who want to get the best audio possible should certainly look towards a pair of over-ears though. A pair of earbuds, no matter how good it is, simply can’t come close to a good set of cans.